We have had an amazing Christmas! We had so much fun I really do not know where to start. Christmas eve is the best place I guess! We enjoyed a lovely family evening. My mother in law came to stay with us over Christmas so we had another pair of hands on board to help with the kiddies. Thanks to the extra help I was able to spend some valuable time in the kitchen preparing vegetables for the big days dinner. I was determined to get as much done as I could so that I could spend time with my family as opposed to being in the kitchen all day. Once I was done I could relax with a glass of wine and enjoy the special, magical evening. We all sat in the living room, before the twins went to bed and watched their favourite film, The Snowman. Once they were all tucked up in bed after leaving a yummy mince pie, carrot and a wee dram for Santa it was time for us to get busy creating the magic. Santa's presents were brought into the house and the last few bits were wrapped. Then the stockings and sacks were filled with the children's presents! Every year we have a budget that we try to stick to. In the past we have been known to go over this budget but as we were both working it wasn't really a problem. However this year I gave up work to become a full time stay at home mum so now we only have the hubby's wage so we knew that we had to stick to our budgets. At first we were worried that the children did not have much. 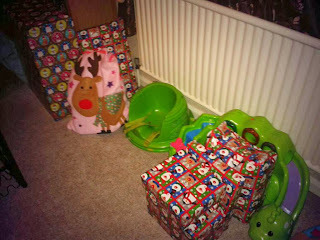 When we actually got their sacks filled and all of their presents out we were amazed by how much they had all actually got. Since the twins arrival late nights have become a thing of the past as they are both early birds so we went to bed as normal. We were so excited to see the children's reactions in the morning! Taylor was the first up as usual! But he was quickly followed by Isabella and then Joseph. Everyone was awake, it was time to go down and get the children's Gran up too! Once they had woken Gran up it was time for them to see what was in the lounge! Taylor just stood there looking at all of the presents saying "wow! wow!" he was amazed by everything that had suddenly "appeared" overnight. We found that Taylor was a little bit overwhelmed by it all. He really took his time opening his presents and wanted to sit and play with what he'd opened before moving onto the next. Whereas Isabella took her big brothers lead and was straight in to see what was she had got. She loved ripping off the paper and soon learnt the word "presents!" 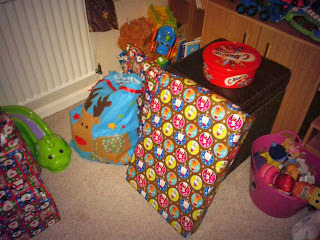 Joseph started on his and we were over the moon to hear his shouts of surprise and delight as he opened his parcels. We needn't have worried about Joseph being disappointed. We had been worrying about this as now we have 3 children the money has to go further and we have had to stick to budgets but he was so pleased with all of his presents and received things that he really was not expecting! Once the children had worked their way through their parcels it was our time! I have been quite excited about the presents that I got for my hubby as I knew that he would love them all and I was not wrong! As for me, I certainly was spoilt again with books, chocolates, pyjamas, baking bits, I even got some of my favourite Crabtree and Evelyn hand cream! Oooh and not forgetting, tickets to go and see Paul Hollywood's Get Your Bake On and a night away!!!!! Excited does not get close to how giddy I was about this present! After we had opened everything it was time for breakfast. I managed to get the children to sit down for all of 10 minutes for breakfast but they were itching to get back to their toys as soon as they could! Taylor is a typical boy and just wanted to lay on the floor pushing his new cars and tractor about. 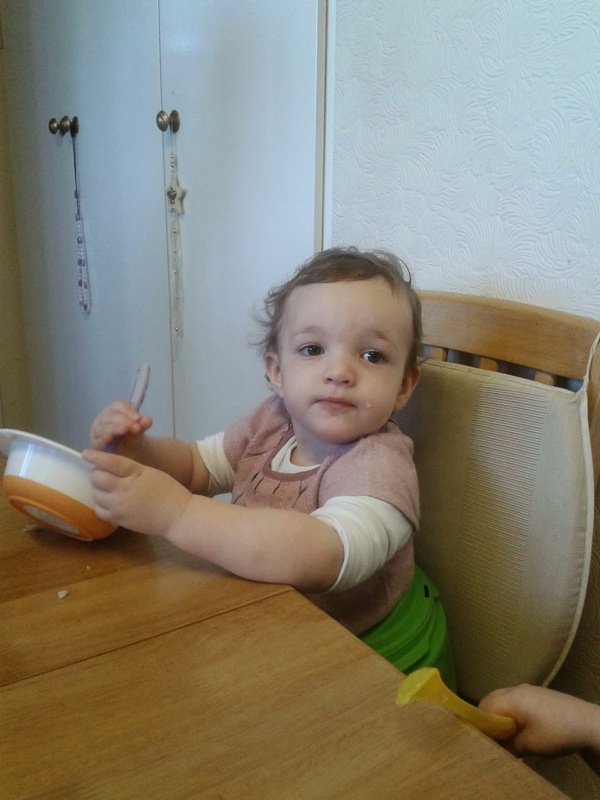 Isabella is certainly like her mummy! We got her a Minnie Kitchen and she loves getting her play food to cook! Like her mummy she is often baking a cake! But at the same time they enjoyed playing together with each others new toys. I love watching them playing together. Joseph was soon up in his bedroom with his new stereo rocking out loud! All 3 children were delighted with their toys! Before our breakfast we surprised Joseph with a few more, unexpected presents. We gave him his wish list that he won from Compare4Kids! His face was a picture when he realised that he had won and kept saying "but I never win anything!" Well Joseph, you did this time! He was so pleased and quickly got hubby to put his name stickers on his bedroom wall! 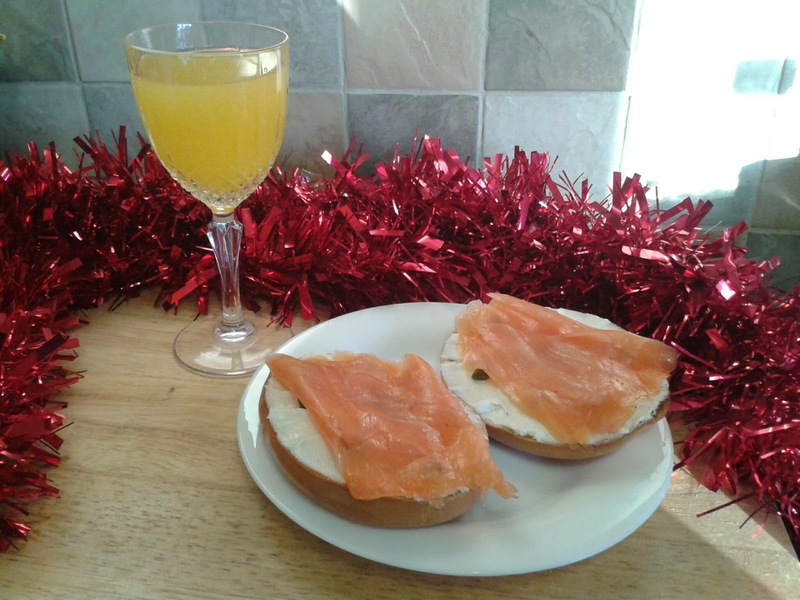 As it was Christmas we treated ourselves to a luxurious breakfast of toasted bagels, topped with cream cheese, capers and finest smoked salmon! This breakfast went perfectly with a cold glass of bucks fizz! 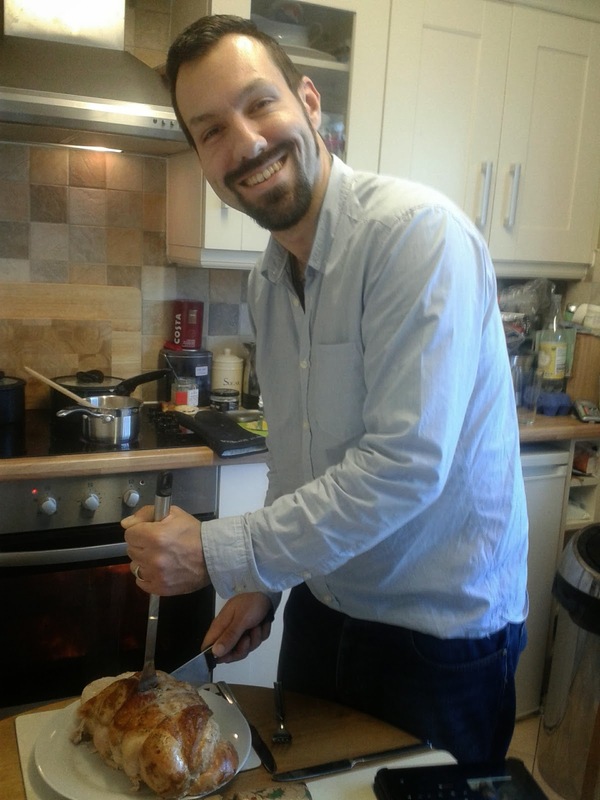 Thanks to a lot of the vegetables being prepared the day before I was able to enjoy the morning with my family. It was lovely being able to give that undivided time and explore their new toys with them. Once it was the twins nap time I was able to relax a little once the turkey was in! I sat with Joseph and played one of his new card games and had lots of giggles with my big boy! He is growing up so fast, so I really do treasure the times we get together. We had so much fun playing and he enjoyed having a bit of time with his mum and dad to himself! Before I knew it, meal preparation time had come! I have been planning this dinner for weeks. This was my first Christmas dinner! 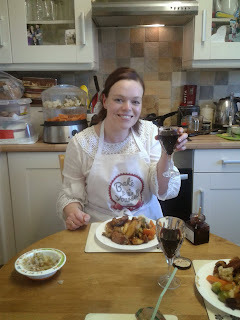 I just kept telling myself, it is a glammed up Sunday roast! I was in my element in the kitchen. Busying around, checking timings, putting the vegetables to cook, preparing the stuffing, I was loving it!!! However, I was so busy thinking about and preparing the turkey dinner, I completely forgot about the starter until everything was ready! I had planned to do a pate starter, however on hindsight it was a good job that I did forget. We had so much food for our main course! We had salt and peppered turkey breast, roast potatoes, mashed potatoes, cauliflower, broccoli, carrots, honey roasted parsnips, pigs in blankets and stuffing wrapped in bacon! 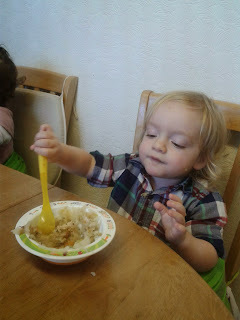 I have got to say there were clean plates all round. Seeing all of my family enjoy their Christmas dinner made my day! My first Christmas dinner was a success! After our huge meal we were too full for my Wee Dram Christmas pudding so we decided to walk our dinner off. We all got wrapped up and walked down to my mum and dad's house as my sister and her family were there along with my nanna. After our trip out I re steamed the pudding. 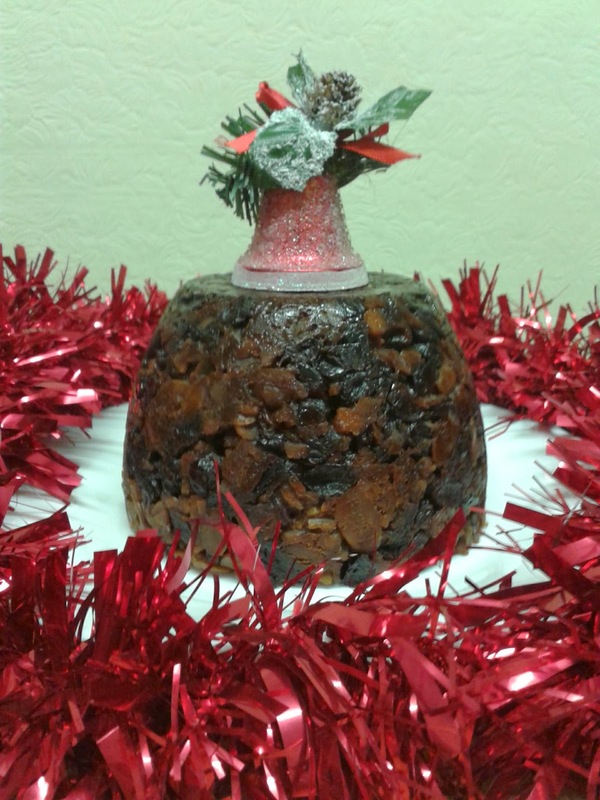 I made this pudding back on stir up Sunday and it has been maturing on a shelf in the utility. I have been so excited about trying this pudding as it is the first one that I have made. Before we knew it 6 o'clock had arrived and the twins were shattered. They had thoroughly enjoyed their day. There had been no tantrums, no tears, just lots of giggles and excitement. Exactly as we had wanted it to be. They took it all in their stride and had so much fun! But bless them they were exhausted. So a little earlier than normal they had their milk and were tucked up asleep in bed. Now it was time to have some quality time with Joseph. As we﻿ guessed, the board games came out! First we played a trivia game that he got, this was a little bit hard but we adapted the questions for him. Next was one of his wish list items. 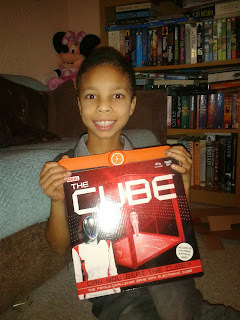 Next it was time for us to face the Cube! This was the first thing that Joseph put on his wish list so he couldn't wait to give it a go! We had so much fun playing games together and Joseph loved the attention being devoted to him on his own! I can confidently say that we had the best Christmas! The twins and Joseph's reactions to their presents was exactly what we wanted from them. They all had a great day. 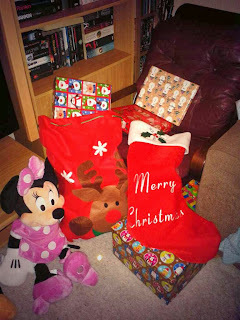 But our Christmas wasn't over, we were doing it all again on Boxing Day at my mum and dads! After a leisurely morning we got ready and walked down to my parents house. We were all spoilt again! We enjoyed another lovely dinner and spent more quality time together. We finished off Boxing day down at our house. Once we got the twins settled my mum and dad came to our house and we all sat and watched Despicable Me 2. Over these 2 days we have created some magical, treasured memories. For me, this is what Christmas is all about.